The enigmatic dedication of Elgar's Violin Concerto is the subject of a major article in today's Independent by fellow blogger Jessica Duchen. In the article Jessica refers to the original letter in my possession written by Mrs Richard Powell, friend of Elgar and the tenth variation, "Dorabella" in the Enigma Variations, which sheds new light on the dedication. Today was scheduled to be blogging free as we are off to Cambridge in a few minutes to hear Mantra being performed by the Orlando Consort and Indian musicians in the chapel of Jesus College. But I have pasted the code from my 2005 article about the letter below to help the search engines. Over the last few days this blog has moved from Lady Gaga and Gregorian Chant to Rachmaninov played by a youth orchestra and Sufi devotional songs and on to Elgar. Current readership figures, which interestingly are increasing, suggest that these paths, all informed by nothing other than the power of music, have been as rewarding to read as they have been to write. Below is the Dorabella Powell letter, Elgar the mystic is here. The score of Elgar's Violin Conerto contains an enigmatic dedication in the form of a mysterious Italian phrase - "Acqui esta encerrada el alma de" - followed by five dots; meaning that the identity of the dedicatee of this perenially popular work is unknown. Some years ago I bought a second hand copy of the autobiography of Mrs Richard Powell, 'Dorabella' of the tenth of the Enigma Variations ('Edward Elgar - Memories of a Variation published by Methuen). 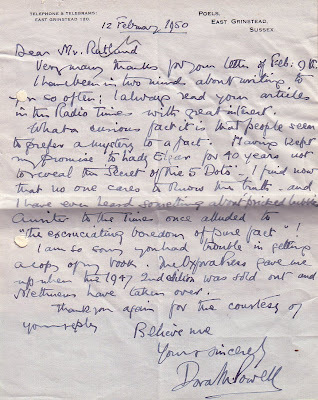 Stuck into the book are hand written letters and postcards sent to the original owner by Mrs Powell who was then living in East Grinstead. "What a curious fact it is that people seem to prefer a mystery to a fact. Having kept my promise to Lady Elgar for 40 years not to reveal the 'Secret of the 5 dots' - I find now that no one cares to know the truth, and I have even heard something about pricked bubble. A writer to the Times once alluded to the "excruciating boredom of pure fact....................Believe me, Yours sincerely Dorah M. Powell"
This seems to be a reference to the paragraph in the book (P.86) which was apparently added in 1946 (the first edition was published in 1937) where Mrs Powell reveals that Lady Elgar told her that the five dots referred to an American friend of the Elgars, Mrs Julia H. Worthington; contradicting the now commonly accepted interpretation that the enigmatic dedicatee of the Concerto is Mrs Alice Stuart-Wortley. I can see no reason to disbelieve Mrs Powell, and if Lady Elgar's explanation is taken at face value there is no 'enigma' to the dedication - the dedicatee is Mrs Julia H. Worthington. But of course the mystery remains unsolved, as we will never know whether Lady Elgar's explanation was fact; or whether it was simply Edwardian expediency created by herself, or by her husband. Maybe not a great revelation, but it is fascinating to have in front of me as I write that apparently factual explanation of the dedication in the hand of one of the famous 'friends pictured within'. Such is the unique magic of second hand books. It appears that the owner of the book (who appears to have been a BBC journalist) was in the habit of sticking interesting memorabilia into his books. I bought from the same source books from his library on Toscanini and Furtwangler, and both have many fascinating newpaper clippings and reviews neatly pasted into spaces between the text - but alas no letters. Oh to return to the days when cut and paste meant using scissors and Gloy gum from a glass bottle with a rubber spout! So there is a very small piece of Elgar history sitting in my library, which may just be of interest to others. A scanned images of the correspondence can be made available to any genuine researchers who may be interested. Interesting to note the rankings of classical music bloggers. Some of my favourites are high up on the list, including The Rest Is Noise and Opera Chic. I think what makes them great is that, like your blog, they are well-written and take unique approaches to a range of topics. To some degree, different genres are also taken into account. I've considered my own musical interests, and wondered (1) why I like music from different genres and (2) if specific pieces of music from one genre might share deeper similarities with pieces from other genres (even if it might not be obvious upon initial listening). This isn't an original idea, but I think the strands of thought that inform it need to be consolidated and given deeper consideration. Fortunately, blogs like this one contribute to such a dialogue.